We love how cute these Valentines cards are and they are super easy to make too. 1. With your free template, draw round the card shape on your chosen paper design. 2. 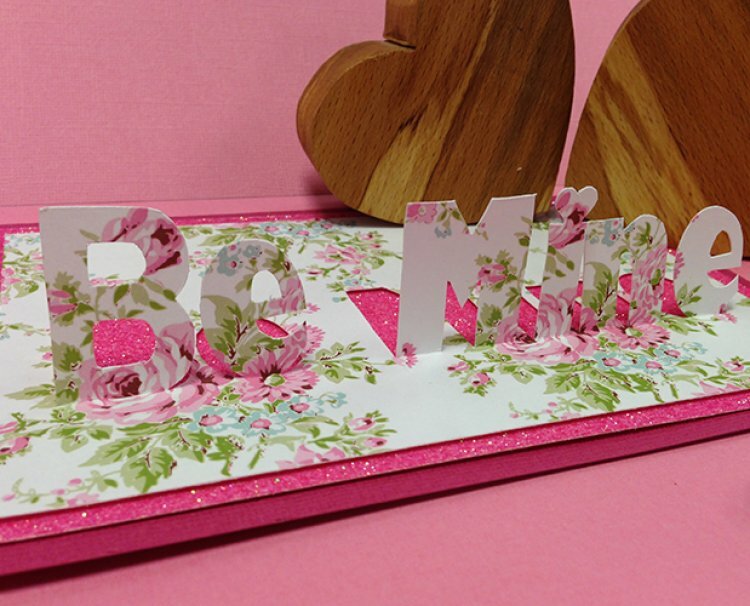 Cut out the letters from your template using a craft knife and draw round them on your chosen paper design. 3. Cut out the letters; remember not to cut the bottom of the letters so they are still attached to the card. Pop the letters up so they are standing up straight. 4. Cut a piece of Glitter card 18 x 11.5cm and a piece of textured card stock 19 x 12.5 cm, layer them together. 5. Finish your card by sticking your pop up design on top of the glitter card. And there you have a fabulous handmade Valentines card, which one will your make 'Kiss Me' or 'Be Mine' tell us below, we would love to hear what you are making for Valentine’s Day, you can also share it in our project gallery.